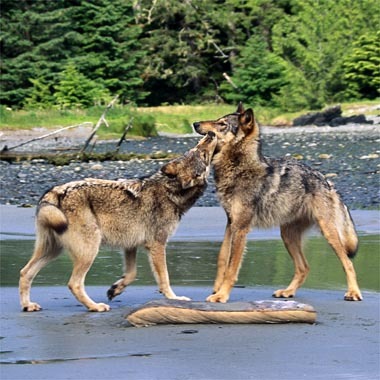 These two wolves were photographed on Vargas Island, off Vancouver Islands west coast. 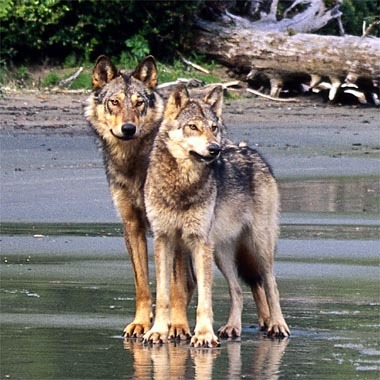 They are the distinct Vancouver Island sub-species of the grey wolf. In June 2000 I ventured out to Vargas Island with the hope of getting wolf photos. I had heard that a dead grey whale was washed up on the beach and that wolves had been seen feeding off of it. I was not prepared for how bold and fearless the wolves were. Their behaviour allowed me to get some spectacular photos of them, but it also alerted me to their history; clearly, they had been habituated to humans. They had been fed by people and socialized to people. Only weeks later these two wolves were dead. In a social encounter gone wrong, one of them approached a kayaker sleeping alone outside of his tent and playfully tugged at his sleeping bag. Somehow in the camper's attempts to scare it away, the wolf became angry and attacked, ripping off a chunk of the camper's scalp. Conservation officers were dispatched to the site and shot and killed both wolves. Autopsies indicated that the wolves were in good health and well nourished. They were between one and two years old, and probably came from a litter that had been born on Vargas Island the previous spring. They played and ran together, shoulder to shoulder, and were almost certainly brother and sister. These wolves died because of humans' actions: because of the people who originally fed and habituated the wolves, and because of careless camping practices and disrespect for the wild environment by the kayak group that was attacked. I am left with the photos of these two magnificent creatures. I use these images to help create awareness of our impact on the wilderness. Please treat all wildlife with respect. Do not feed wild animals. Every one of our actions has an impact down the road. Photos of these wolves are for sale as Limited Edition prints. A portion of proceeds from sales is donated to organizations dedicated to helping wildlife or conserving wildlife habitat. To see more of my photographic work, please click on the Jacqueline Windh Photography link.